The love that the fans and now the media have for Willians Astudillo is great. It is fun, inspiring, laughable and also good baseball. Out of nowhere Astudillo has risen to mythic levels for his speed, his body, his smile, his hitting skills, and his ability to play everywhere. It got me thinking – who else has had this unique position on the Twins roster – beloved for the style and character that they bring to the team. Puckett was a similar build and a similar smile. If we forget the off the field issues we see Puckett in that ambassador of baseball position. Of course Puckett was also a HOF centerfielder and hitter who would have been great even if he did not smile so much. But his HOF ballot was stamped with a collective smile and laugh. He was beloved within the game and brought joy – one stat that still cannot be measured. Hrbek enjoyed his life and gave us a lot including some professional wrestling moves on the field, but he cannot rank with the two above. Punto was an all-around utility player who did not have the same charisma with the fans as he did with the manager, but he lasted a long time on the skills and work ethic that he did possess. Going to the early days of the franchise it was Cesar Tovar that everyone loved. Cesar played everywhere and he played better than Punto and any other Jack-of-all-trades player in team history. He is the first Twin to have an every position day and he did it well. When Carl Yaztrezemski missed getting a unanimous vote for MVP in 1967, it was Max Nichols, beat writer who gave Tovar his vote. 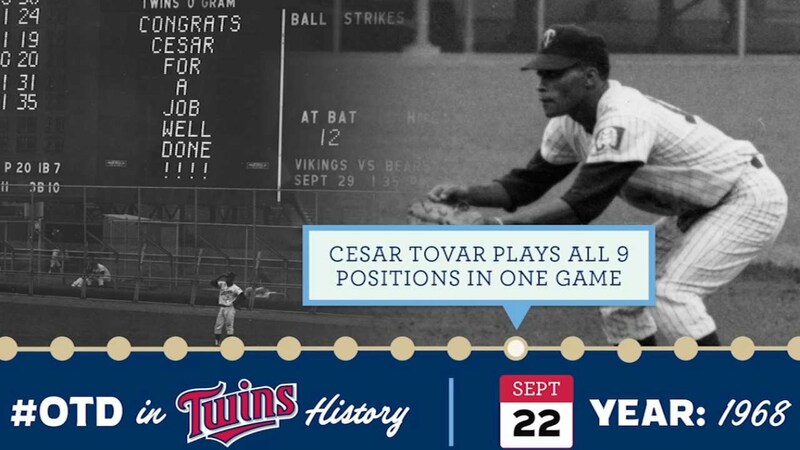 ““He played six positions for the Twins and I saw him win games for them at all six positions. We didn’t have the best of player relations on our club, but Tovar never got mixed up in any of the clubhouse politics. He kept plugging away, no matter where they put him, and to me he did a tremendous job. If I wanted to be a ‘homer,’ I would have voted for Harmon Killebrew. But Tovar was my choice and, if I had to do it all over again, I’d vote for him again.” Billy Martin said he would have had his vote too! Will Astudillo have a career to match Tovar? I know that like Punto and Tovar that when he is given a chance he will hustle and produce. Like Hrbek and Puckett he can be a winner. I was at a game at the Met during which the Guthrie Theatre (in preparation for the play Julius Caesar) requested that the crowd yell "Hail Caesar," after which Tovar came out of the dugout and tipped his hat. I think the comparison to Puckett is quite poignant. They both appeared from thin air and they both were able to hit pitches that others would either take for balls or flail at. They both loved playing the game and they both hated taking walks.